Wild Game Dynasty March 9, 2018 Bucks n Bears, Friends of ELO, Take A Hike! The 2017 firearms deer season was real interesting, not to mention somewhat challenging in regards to weather, at least in my Thumb area. Opening morning although a touch breezy was at least dry, but you could sense wet weather was on the way, which arrived around noon with the increased wind intensity of a typhoon. It didn’t take me long to put boots on the ground, because trying to accurately hit the mark from my weaving ladder-stand, would have been similar to trying to shoot from the back of a galloping horse. However, dealing with wind-driven rain wasn’t much of problem, thanks to my new high-tech outerwear, which would get a genuine field test during the remainder of the season that featured rain on a regular basis and daily winds that averaged 20 mph or more (which also put a damper on my favorite technique of using deer vocalizations to lure deer into range). I can remember when dealing with wet weather required waterproof outerwear that didn’t breath and there were times due to my activity levels, perspiration caused me to be nearly as wet on the inside as the outside of the outer garment. This factor would begin to change 30 years ago when a high-tech fabric known as “Gore-Tex” began to be used in outdoor clothing, including boots, hats and gloves. Back in 1969, Bob Gore discovered that expanded polytetrafluoroethylene (don’t ask me to try and pronounce that one), when rapidly stretched under special conditions, created a microporous material which possessed good weathering properties and very low water absorption. A drop of water is around 20,000 times larger than one of the billions of microscopic pores. However it wouldn’t be until 1978 when waterproof yet breathable Gore-Tex would be introduced to the world and change the face of outdoors outerwear. I gave it a whirl right away with leather hunting boots and it worked admirably as advertised and I then immediately gave a set of outer garments a try. This would be Columbia’s mid-weight “Silent Rain” camouflage pants and hooded jacket which were quiet while moving in brushy environments, and ultimately were waterproof and windproof. I could tell Columbia had done its research with hunters, because the cut of the garments were truly designed for even bowhunting, and the hood offered excellent peripheral vision, which some hoods do not (and being in a driving downpour or working through snow-covered brush, a hood is the most efficient in keeping moisture from going down the back of your neck). Being also tough as nails, this outfit has given very reliable use for over two decades now and is still ticking. It even held up when I miscued my footing in low light during a bear hunt a couple years ago and I slipped off a ledge and slid a ways down a very steep granite face. I can assure you that was quite a thrilling way to field test gear to the limits! I firmly believe in using the layering system for my outdoor adventures, which starts with a base layer that readily transfers perspiration (I avoid cotton which retains moisture) to the insulating mid-layers which also transfer perspiration on to the breathable yet waterproof and windproof outer layer. I prefer a mid-weight (non-insulated) outer layer because it can readily adapt to a wide temperature range and works for me with the layering process, whereas insulated outerwear does not. Adding or subtracting the mid-layers does the trick for me according to ongoing temperatures and my activity level, and I’ve experienced some rather brutal conditions in relative comfort thanks to the high-tech outer layer. Since a majority of my outdoor activities entails being able to blend in with a variety of environments, I prefer camouflage for the outer layer and there is an amazing array of camo patterns today to select from. When I need something in regards to blending in with a snowy atmosphere, I have a set of snow camo pants and jacket which readily fit over my high-tech outerwear, and whenever hunter orange is required, I simply add on a blaze orange vest. Although Gore-Tex blazed the way and is still going strong, other name brands of waterproof, windproof and breathable outerwear have come along, and the selection available to outdoor consumers now is truly amazing. Even though my durable Silent Rain outerwear is still ticking great, time has a way of changing things. I would like to say my outerwear might have shrunk some over the past two decades, but that isn’t the case of all. I must admit I’ve gotten a bit “bigger”, in certain parts anyways. An example is the pants which used to require a belt, but now, the only reason for a belt is to hold a knife sheath. I knew it was time to do a bit of literal “upgrading”, especially to keep in tune with my layering process. It is not a good thing when you need to maximize on layers and it becomes a bit snug. I had been perusing matters, and yes folks there are a whole lot of quality brands to select from today, which I truly appreciate. This is where good fortune smiled upon me a year ago during a drawing at an outdoor writer’s meeting, and my Queen of Hearts was pulled out of the hat. Purely by chance, I was introduced to Rivers West outerwear (www.riverswest.com) and I truly look upon it as a fortuitous blessing. Rivers West outerwear was developed and thoroughly field-tested in the rugged Cascade Mountains of central Oregon. It entails their “Advanced Waterproof Fleece” (AWF) which is light in weight yet durable, quiet, very breathable and ultimately waterproof and windproof. I opted for the mid-weight “Frontier” jacket and pants in Mossy Oak Bottomland camo (the old original camouflage pattern created by Toxey Haas over 30 years ago and which remains my favorite because it works in a wide variety of hunting applications). common sense pockets (similar to those found on jeans), a zippered fly, elasticized waist and suspender buttons. I’ve long appreciated suspenders which keep everything in place and eliminate the constricting pressure that can be caused by a tightly cinched belt, which isn’t a good thing in the layering process. Fleece is often very susceptible to noxious seeds and burs attaching and becoming a real nuisance. Rivers West AWF has a unique nap that if anything does latch on, it can be easily brushed off with your hand, which I truly appreciate, because I’m frequently venturing into brush which features clinging items. Needless to say the 2017 firearms deer season put my new high-tech Rivers West outfit through an intense field test and it passed in flying colors. 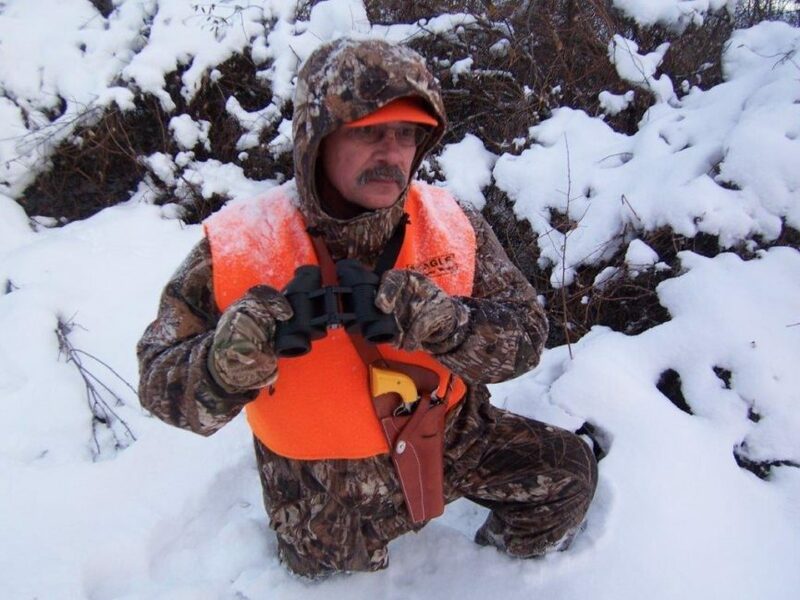 There was also the brutally cold late-antlerless deer season where it worked ideally with the layering system and readily warded off moisture and bone-chilling winds. It is presently playing a key role in wintertime rabbit, squirrel and predator hunting featuring plenty of snow. There is also spring turkey hunting, a lengthy spring canoe trip down the Cass River, as well as a spring northern Ontario fly-in fishing trip coming up, and will be here before I know it. It is very comforting knowing I have dependable high-tech outerwear on hand and ready to meet any outdoor challenge. The whimsies of Mother Nature have a tendency of throwing the unexpected at you and thanks to today’s waterproof, windproof and breathable fabrics they are a lot easier to deal with in comfort.